‘if pictorial expression has changed, it is because modern life has made this necessary.’ Fernand Leger 1914. Compare the two abstract print projects: 2.1 Formal Abstract Prints and 2.2 Random Abstract Prints. What are the advantages and disadvantages, similarities and difficulties of each? Which do you prefer and why? The formal abstract print produced a very clearly structured image where a lot of thought and pre-planning was required. However at the inking stage many different and accidental chance effects are possible. This would be a possible way of producing some of the colour field effects, particularly those of Clyfford Still – trapping lines of ink between blocks of colour and even letting them overflow. The embossing also produced interesting textural effects, particularly when rotated and overprinted. The random abstract print is more intuitive and subject to chance and accident – sometimes ‘happy’ sometimes not so happy. 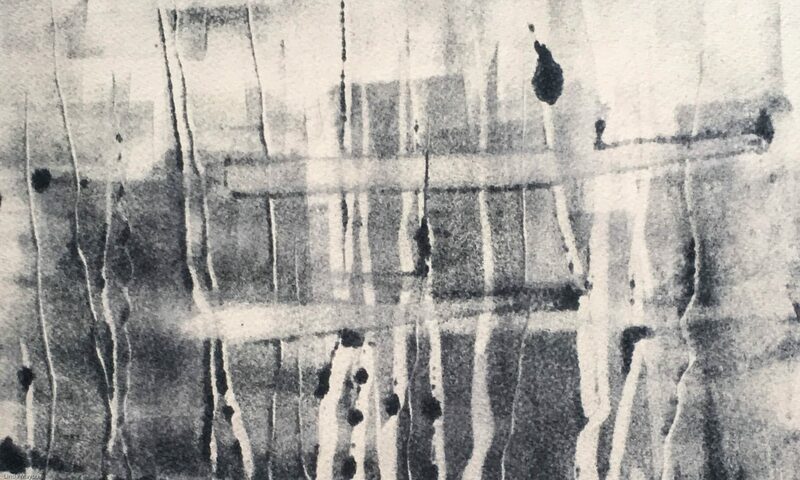 With printmaking there is even less control over the final image than with paint because it is often unclear which ink has dried and which has not, and which ink will ‘squish’ and what will retain its mark with different pressures. But I particularly liked the effects of Akua inks and Schminke water-based inks and images produce by printing from old ink marking on the plate. I like both approaches for different types of effect. The one can also inform the other. And – as in Assignment 2 – it is possible to take advantage of both approaches and use random ink effects on a structured collagraph plate. How does the Alan Bowness quotation below relate to your experience of abstract painting? What abstract elements are missing from this writing? Colour is only one among many other elements – line, shape, tone, texture. Find examples of the sorts of abstract prints you like and make notes on them. Abstract art uses a visual language of shape, form, colour and line to create a composition which may exist with a degree of independence from visual references in the world. Abstraction exists along a continuum. All art is in some degree abstraction. Even figurative art involves varying degrees of selection, interpretation and transformation of the ‘reality’ as perceived by the artist into an image that is then subject to further interpretation by the viewer. Partial abstraction through obvious alterations of eg colour or form. The artist selects a form and then progressively simplifies it until the image bears only stylized similarities to the original, or is changed almost entirely beyond recognition. Total abstraction bears no trace of any reference to anything recognizable. This may be the end product of an abstraction process, or the art may not have started with any specific external reference. Abstraction has been evident in the art of many cultures throughout history. The emergence of abstract art also relates specifically to changes that were occurring within painting itself. the development of photography from the 1840s led to a re-evaluation of the artist’s role as depictor of reality. But also a freedom to focus on depiction of more subjective, interior realities, and of emotions…. Gauguin’s advice to ‘paint by heart’. increasing awareness of non-Western art in which spatial perception and artistic depiction were based on different premises. Blaswick (2015 p9) makes a distinction between biomorphic abstraction, geometric abstraction and abstract expressionism, although these categories are often fluid and individual artists may not easily fit into any one ‘school’ and/or may combine more than one approach. Cubism Georges Braque and Pablo Picasso further developed this focus on multiple perspectives in analytic Cubism. Synthetic cubism and Dada practised by Braque, Picasso, Fernand Léger, Juan Gris, Albert Gleizes, Marcel Duchamp, Kurt Schitters produced abstract collages of different textures, surfaces, papier collé and a large variety of merged subject matter. Picasso went on to more emotional and shaped forms of abstraction like his paintings of Guernica and female nudes, notably the painting Les Demoiselles d’Avignon 1907 and his paintings of 1932. These drew on cubism and also African art. This abstraction was reflected in his many monoprints, linocuts, lithographs, drypoints and etchings. Expressionists and Fauvists explored the bold use of paint surface, drawing distortions and exaggerations, and intense colour and to produced emotionally charged paintings that portrayed psychological states of being. Fauvist paintings of André Derain, Raoul Dufy and Maurice de Vlaminck were “wild”, multi-coloured, expressive, landscapes and figure paintings. Woodcuts of the German Expressionists produced powerful abstracted portraits and landscapes. Henri Matisse uses expressive colour and free and imaginative drawing in French Window at Collioure, (1914), View of Notre-Dame, (1914), and The Yellow Curtain from 1915. Then takes this expressive use of colour and shape further in his cut-outs. Futurists and Vorticists: with their preoccupation for speed and energy of modern urban life. The Italian poet Marinetti published ‘The Founding and Manifesto of Futurism’ in 1909, which inspired artists such as Carlo Carra in, Painting of Sounds, Noises and Smells and Umberto Boccioni Train in Motion, 1911. These then influenced Vorticists like Wyndham Lewis and printmakers like Sybil Andrews , Claude Flight and Cyril Power of the Grosvenor School. Georgia O’Keeffe‘s highly abstract forms based on flowers. Characterised by pure forms based on mathematically defined systems and monochromatic and non-representational surfaces. Geometric abstraction has characterised Islamic art for many centuries – deriving from both development of geometric theories themselves, and the banning of figurative art in certain Islamic religious cultures. Geometric abstraction has been further developed by contemporary Arab artists as part of identity and political art. In the West geometric abstraction originated in the late 19th century in Eastern Europe mysticism and early modernist religious philosophy as expressed by theosophist Mme. Blavatsky, Georges Gurdjieff and P.D. Ouspensky who popularised for a Western audience the sacred texts of India and China. They proposed that certain universal and timeless geometric forms like the circle, square and triangle and colours had intrinsic spiritual meanings as fundamental systems underlying visible reality, pointing to a ‘higher truth’. Wassily Kandinsky, and Hilma af Klint who were heavily influenced by theosophical theories. Piet Mondrian whose interest in relationships between geometry, colour and balance was also influenced by spiritualist ideas. St. Ives group in Cornwall including Barbara Hepworth, Ben Nicholson, Naum Gabo, Patrick Heron. Constructivist and Suprematist artists like Malevich and artists of the Russian Revolution who saw geometric abstraction as a way of promoting Utopian social change. Emphasises the existential act and process of producing the image (see post). Gesture artists: Jackson Pollock focus on gesture. Colour field artists: Rothko, Ad Reinhardt, Barnett Newmann and Clyfford Still focus on the emotional impact of colour fields. Edwards, S. & Wood, P. (eds.) (2004) Art of the Avant-Gardes, New Haven and London: Yale University Press and The Open University.